We've selected some of our most Irresistible Stuffed Olives - Ready to go!! 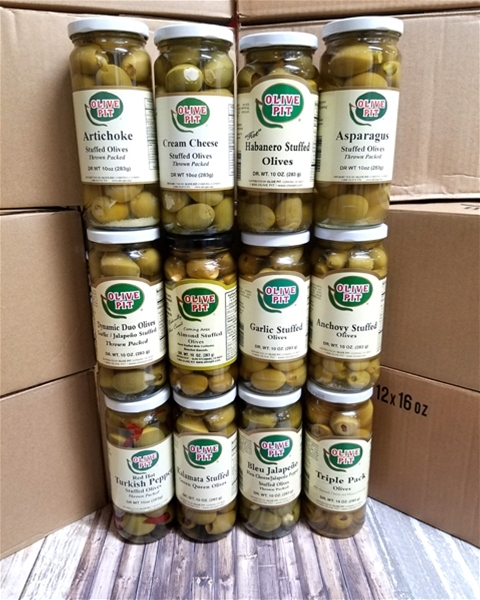 12 pints of Stuffed Olives, Anchovy Stuffed, Habanero Stuffed, Asparagus Stuffed, Corning Area Garlic Stuffed, Corning Area Almond Stuffed, Dynamic Duo Stuffed, Artichoke Stuffed, Triple Stuffed, Kalamata Stuffed, Blue Jalapeno Stuffed, Turkish Pepper Stuffed and Cream Cheese Stuffed. No subs please. We've taken the hassle out of ordering and loaded this box full of our delicious stuffed olives and it's one click away. If you have family or friends coming over for a visit or are hosting a party, this box is for you. Or just fill your pantry and keep them for yourself.